Summary: Quicksilver and Scarlet Witch learn from their father that they were adopted. He claims that Bova might know who their true parents are. They discover Bova at Wundagore Mountain, the home of the High Evolutionary. Bova reveals that their mother Magda died shortly after giving birth to them; she also reveals that Magda was terrified when she arrived at Wundagore Mountain, after witnessing Magneto destroy a human village. Meanwhile, Magneto informs Xavier that he’s received word Magda could be alive. Xavier orders Wolverine to follow Magneto in case it’s a trap. Eventually, High Evolutionary makes his move. Magneto, Scarlet Witch, Quicksilver, and Wolverine are all kidnapped, with the goal of using their DNA to enhance his evolutionary experiments. The mutants are stunned to learn from High Evolutionary that Magneto is the true father of Quicksilver and Scarlet Witch. Xavier and Beast arrive in the Blackbird to rescue Wolverine, as Magneto frees his children. The High Evolutionary teleports away, leaving the mutants behind. Magneto tries to reconcile with the twins, but they refuse his offer. The only X-Men appearing this episode are Wolverine, Beast, and Professor Xavier. 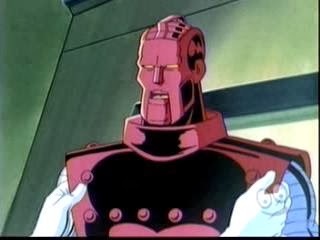 The Scarlet Witch and High Evolutionary make their first real appearances on the show. Bova also makes her animated debut, along with the New Men. Magda is Magneto’s wife, who is referenced for the first time on the show. The story of Magneto destroying a Russian village and Magda fleeing in horror was told in the backup story in Classic X-Men #12. The High Evolutionary turns Wolverine into a werewolf after capturing him. He’s magically restored to normal, along with everything else on Wundagore Mountain, after High Evolutionary teleports away. Approved By Broadcast Standards: The full story of Magneto destroying the Russian village, including his daughter Anya dying in a fire, isn’t detailed. Merely stating that Magneto “destroyed an entire village” is somewhat daring, though, creating a pretty clear idea of what he did. Review: “Family Ties” should’ve felt like a momentous event, yet I’ve rarely been able to stay awake while watching the episode. Perhaps one reason is the fact that Quicksilver and Scarlet Witch have never played a real role in the series. Quicksilver was just one of the faceless members of X-Factor in one episode, while Scarlet Witch only appeared once in a half-second cameo. From the perspective of the cartoon’s audience, the questions are 1) who are these people, and 2) why are we suddenly being told they’re Magneto’s children? These revelations were cornerstones of an era of Marvel Comics, but only because the readers were already familiar with the characters, and the actual confirmation was teased over the course of a few years. There was a real sense of payoff when the information was verified; here, it just comes out of nowhere. When High Evolutionary informs Magneto that he IS the father of those babies, it’s hard to comprehend why it’s supposed to matter. And bringing the High Evolutionary, Bova, and the New Men into this…sheesh. I can appreciate the fidelity to the source material, but these are all characters that ultimately have little to anything to do with Magneto, Quicksilver, and Scarlet Witch. If you’re looking for the comics for inspiration, the meatiest material comes from Quicksilver and Scarlet Witch’s time (grudgingly) serving Magneto in the Brotherhood. Introducing the High Evolutionary into the story just seems like an excuse to turn Wolverine into a literal wolverine -- and the episode doesn’t even make that much sense. Instead, he turns into a werewolf, in perhaps the dumbest moment in the show’s run. Add this to the lifeless animation and washed out colors and the viewer is left with one of the most disappointing episodes of the series. Summary: After suffering a minor concussion, Professor Xavier falls into an apparent coma. Inside the Astral Plane, Xavier hears a voice calling him, as he reflects on the events that led to the creation of the X-Men. Eventually, Xavier realizes that the voice belongs to the Shadow King. As Shadow King’s psychic creations invade the mansion, Jean Grey enters the Astral Plane to help Xavier. With her aid, Xavier is able to send Shadow King back into the void within the Astral Plane. What caused Xavier’s concussion is never revealed. I guess this was considered a minor enough detail to leave out. Xavier’s first meeting with Shadow King, and Storm as a child, from Uncanny X-Men #117 is recreated in a flashback. Wolverine, Storm, Rogue, and the five original X-Men all appear in their original costumes during a very brief flashback. The flashback of the original X-Men training in the Danger Room from “Sanctuary” is also repeated. “Um, Actually…”: In Xavier’s flashback, the Shadow King is not in his Amahl Farouk form. (Perhaps the censors thought it was too stereotypical? Or the producers thought Ren & Stimpy owned the fez by this point?) 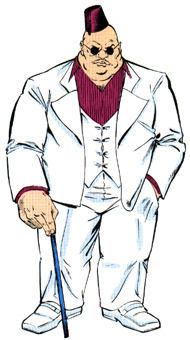 Instead, he resembles FBI investigator Jacob Reisz, the person whose body Shadow King stole circa Uncanny X-Men #255. “Huh?” Moment: In a flashback to their first battle, Xavier and Shadow King morph into giant Kirby monsters inside the Astral Plane. Production Note: The closing credits have returned to running a brief scene from a previous episode again. Review: “Xavier Remembers” has a solid premise, but boy is the execution shaky. Very little of this episode actually consists of Xavier’s mental trip to the past; instead, we’re treated to scene after scene of poorly choreographed fights between the X-Men and fake versions of Sabretooth, Mr. Sinister, and the Sentinels. Even inside the Astral Plane, Xavier spends much of his time fighting Shadow King in various forms, when he isn’t floating around in a dead empty space. The history of Xavier is rich territory to mine -- an alcoholic mother, abusive stepfather and stepbrother, a military stint, crippled at a young age, two failed relationships with horrible endings, and a friendship that turns into a deep rivalry. Some of this material would have to be toned down for the show, but the series at its best manages to hint at the more adult ideas in the comics without scarring any kids for life. (Even by the third episode we already have a vague reference to the Holocaust.) This episode brings us a quickie recap of Uncanny X-Men #117, a very brief clip of the X-Men in an earlier incarnation, and…that’s really it. If the action scenes worked this could at least be an excuse to see a montage of the X-Men’s villains fighting the team, but all of the fights are rather bland, and the overall animation this episode is weak by Season Four standards. And as the Xavier episode, this is a major disappointment. Xavier’s past was explored much more effectively in the first chapter of “Sanctuary”…which wasn’t an Xavier-specific episode! Summary: Cyclops travels to Skull Mesa, Arizona, the home of Dr. Taylor Prescott. He’s shot down as he flies over the town, and discovers after he lands that his powers are gone. In town, he meets Daryl Tenaka, who informs him that Dr. Prescott is missing. Eventually, Cyclops discovers that the pro-mutant community Dr. Prescott created has been co-opted by Solarr, who’s imprisoned Prescott and recruited the mutant citizens into mining gold for him. Cyclops appeals to the citizens and convinces most of them to turn against Solarr. Daryl Tenaka restores Cyclops’ optic blasts, allowing him to defeat Solarr. Dr. Prescott is freed and Cyclops returns home. Taylor Prescott is a human doctor who knew Cyclops as a child and defended him from local bullies. Over the years, Dr. Prescott befriended Professor Xavier and formed his own community for mutants in Arizona. 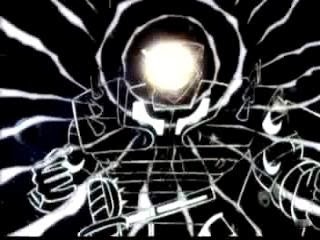 Numerous mutants appear in this episode. Most are established characters from the comics, but a new character named Watchdog (a humanoid dog) is prominently featured as one of Solarr’s main flunkies. Established characters that live in Skull Mesa include Ape, Mole, Sunder, and Tommy from the Morlocks, Tusk, Toad, Forearm, Reaper, Strobe, Random, Senyaka, and Arclight. Another mutant, Chet Lambert, is apparently a new creation, although I wonder if he’s intended to be the cartoon’s version of the Vanisher. Solarr’s real name of Bill Braddock is emphasized throughout the episode. I wonder now if Solarr was meant to be the brother Psylocke claimed was fighting for mutant rights back in “Beyond Good and Evil.” I realize it’s an insane theory, but Solarr is presented as a bigoted anti-human mutant who’s basically doing a cheap Magneto imitation. Also, it would seem the real name “Bill Braddock” is an invention of the cartoon’s, as he’s named Silas King in the comics. Review: It’s yet another Cyclops story that isn’t the one that’s next in continuity. Incredibly, Cyclops ended up with three episodes dedicated to him, even though he’s tied with Storm as the show’s least engaging star. (I would’ve said “most irritating,” but then I remembered how much people hated Jubilee.) This episode is, bizarrely, another one with a plot borrowed from Spaghetti Westerns, and also the introduction of a retconned character that’s apparently the human equivalent of Charles Xavier. I guess there’s nothing inherently wrong with the concept of a human doctor gathering a group of mutants and establishing a town for them to live in, but it seems strange that we’re only learning of this four seasons into the show. Skull Mesa would hypothetically be an important step in human/mutant relations, and something the X-Men would want to keep an eye on. As presented in this episode, Cyclops visits the town almost on a whim and is shocked to learn things have gone terribly wrong. Making this more implausible is the story’s insistence that Prescott had a profound impact on Cyclops’ life as a child and he still considers him a great friend. Yeah, sure he does. I think the concept would’ve worked much better if any mutant other than Solarr were leading the mutant gang (called “The Children of the Shadow” in the Wiki description but never in the episode). I’ve read, obviously, far too many X-Men comics and I don’t even know who he’s supposed to be. His design is fine as a generic mutant flunky, one obviously designed in the '70s, but he doesn’t look nearly imposing enough to be considered a serious threat. Making the episode even more unintentionally hilarious is seeing the mutants in town wearing their supervillain costumes, even though they have normal blue-collar jobs. Tusk, perhaps the strangest design within the Dark Riders, is the town’s mechanic, yet he’s still wearing a leotard and shoulder-spikes, and the little people living in his back (I really do love Tusk) are dressed in full Jim Lee garb with headdress. Even Toad is walking around town dressed in his clown jester outfit and everyone just accepts it. I like seeing these cameos from the comics as much as the next person, but it’s amazing to me that the animators didn’t consider how ridiculous this looked. And once you get past the cameos, which are fun to spot, you’re left with pretty generic Saturday Morning material. I will say, however, that Norm Spencer is surprisingly decent as Cyclops this episode. He’s still far from perfect, but most of his line readings are natural and fairly subdued. Once again, I have to wonder why he couldn’t deliver these performances more consistently during the show’s run. Summary: Wolverine witnesses the crash-landing of a giant space whale, the Acanti, while meditating in the desert. Inside the whale is a race of aliens determined to locate the X-Men and use their superhuman bodies as hosts for their offspring. Meanwhile, Rogue is reunited with her first boyfriend, Cody. Cody tries to draw Rogue away from the X-Men, and eventually she learns the truth -- Cody has been possessed by the aliens. Rogue joins the X-Men in the desert after Xavier receives Wolverine’s distress call. The Acanti’s whale song harms the aliens, giving the X-Men a critical edge. 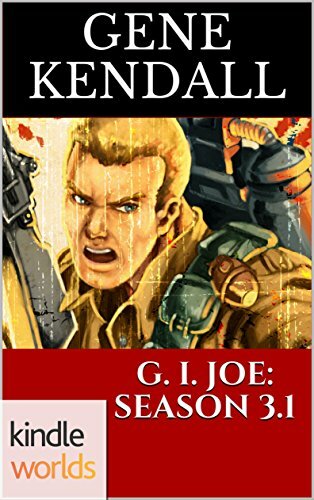 Rogue tries to rescue Cody, but is forced to acknowledge that he can no longer be human. The team this episode consists of Xavier, Wolverine, Rogue, Storm, Gambit, and Beast. 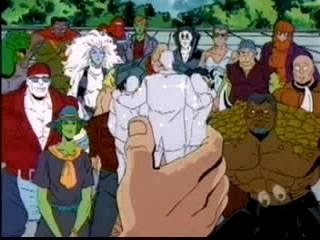 Cyclops and Jean Grey make cameos in the opening, while Jubilee does not appear. Much of this episode is inspired by Claremont/Cockrum Brood stories from the early ‘80s, particularly the arc that begins in Uncanny X-Men #162. Cody first appeared in this series in episode nine, “The Cure.” He kissed Rogue as an adolescent and fell into a coma. He claims that the aliens have now cured him. "Actiiing! ": Rogue’s voice is unusually high this episode. So much so that I occasionally wondered if she was played by a different voice actress. Production Note: The montage closing credits sequence has returned again. Review: Every comics fan had to have the same reaction to this episode…“That’s not the Brood!! !” I wasn’t even much of a fan of the Brood and was annoyed by the arbitrary changes made this episode. We have aliens that live inside an enslaved space whale, serve a queen mother, and want to house their babies inside superpowered humans. Yeah, that’s the Brood, and yet bizarrely, the show has chosen to totally redesign them and never call them by name. I would guess it was a decision made fairly late in the game, also, since Wolverine’s numerous references to the aliens as “cockroaches” remain in the episode. That's especially galling since the cartoon’s redesigns in absolutely no way resemble roaches -- they almost look like Tars Tarkas, but with Dr. Octopus arms. Not exactly an inspired design. I can’t imagine why the Brood designs were deemed unusable; the Brood have already made brief cameo appearances before, so it’s hard to believe that someone suddenly decided they couldn’t be used. Did the censors abruptly deem the Brood too scary? Did Legal take a hard look at them and decide they looked too much like Alien? So, what do we even call these aliens? The Wiki summary of this episode refers to them as “The Family,” which is a phrase I don’t recall ever hearing in the episode. The aliens are called “The Colony” repeatedly throughout the story, so I’m going to assume that’s their unofficial name. I’m guessing that the producers didn’t want to use the Brood name if the characters couldn’t look like the Brood, which is fine, but I would’ve preferred a total reinvention if the characters couldn’t be properly translated in the first place. The only real difference, aside from the visuals, is that these aliens use spores instead of embryos, another annoying change that’s likely there to appease censors. Ignoring the purists’ gripes, the episode still has little going for it. Rogue’s standard character crisis is dramatized nicely in the opening, but her reunion with Cody quickly turns into a joke. Cody’s now possessed by alien spores and he’s trying to recruit her into joining the little green men. There’s some relatable, human drama. Some of the moments lifted from the comics, such as Wolverine fighting off the not-Brood’s possession, are kind of entertaining, but even that turns comical once you see Wolverine morph into an Ed Wood alien. This is just a disappointment all around, with the possible exception of a very loyal translation of the Acanti, and some surprisingly Cockrum-esque background paintings. Summary: Wolverine, growing increasingly unhinged, leaves the X-Men for Japan. He tries to find inner peace with Master Oku, a mentor from his past. Jubilee, distressed over Wolverine’s state of mind, sneaks out of the mansion and follows him to Japan. Meanwhile, Master Oku’s village is invaded by bandits led by the Silver Samurai. Wolverine is asked to help the villagers fight against the Samurai’s men and stop their yearly “tribute” payment. After speaking to Master Oku, Wolverine realizes that his true role is that of protector. He helps the village defeat Silver Samurai and end the yearly extortion. After being reunited with Jubilee, Wolverine returns home. “Um, Actually…”: As far as I know, Silver Samurai has never led a gang of teenage motorcycle thugs in the source material. Review: And this is how the show eventually got around to the obligatory “Wolverine in Japan” story. By the standards of the series, it’s not a terrible solo Wolverine story, but anyone expecting something on the level of the original Wolverine mini is bound to be disappointed. The best character work in the episode occurs in the first five minutes, as the story opens with a therapy session between Professor Xavier and Wolverine. 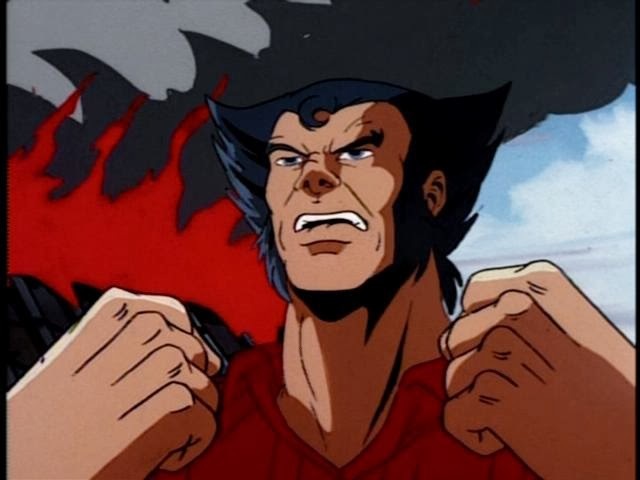 There’s a montage of past episodes, all featuring some psychological turmoil for Wolverine, which is a nice reminder of the tighter continuity of the earlier seasons. Wolverine’s anguish over losing control and devolving back into an animal is well played, largely because Cal Dodd does such a fine job selling the idea. After Wolverine actually arrives in Japan, the story focuses less on a coherent character arc, or an exploration of Japanese culture, and somehow turns into a Spaghetti Western starring Wolverine. Two characters are introduced, the hotheaded Suichi and his peaceful sister Kisora, but they remain ciphers throughout the episode, simply fulfilling the roles you would expect them to play. 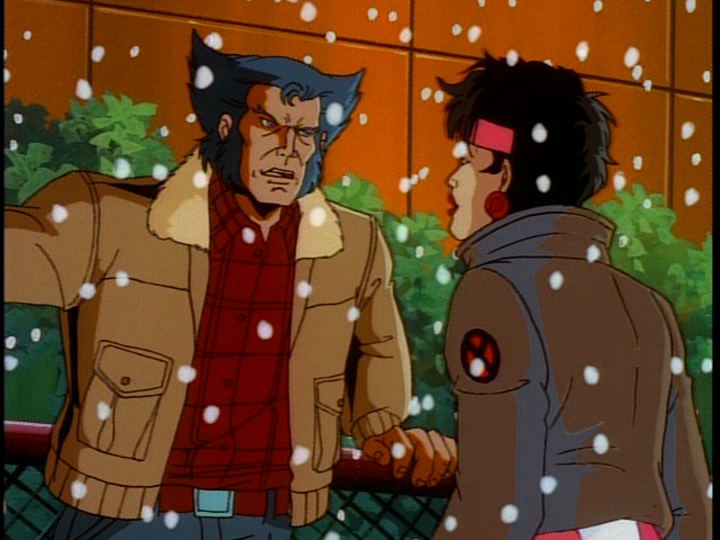 And Jubilee’s decision to travel to Japan leads to absolutely nothing, although I guess the producers saved a few dollars by recycling footage of her poorly piloting a mini-jet from Season Two’s “Red Dawn.” There is some effort to resolve Wolverine’s conflict from the episode’s opening, which of course can’t end with him quitting the team. Master Oku teaches Wolverine that everyone has their purpose, and perhaps Wolverine’s can be found in protecting others. Really, this is just a way to rationalize Wolverine’s vaguely Buddhist beliefs with his role as the most violent character on Saturday Morning TV, but the scene accomplishes what it needs to. Wolverine’s scenes with Master Oku are the highlight of his trip to Japan. Silver Samurai and his teenage motorcycle gang are best forgotten, however. Even as irony, they're not particularly enjoyable. Summary: As the X-Men prepare for Christmas, Wolverine and Storm take Jubilee shopping in Manhattan. Their trip is interrupted when they discover an ambulance that’s been hijacked by the Morlocks. Realizing that Leech needs medical attention, the three X-Men help the Morlocks escape the authorities and follow them into the sewers. As Leech nears death, Wolverine reluctantly agrees to do a blood transfusion. On Storm’s orders, Rogue flies Beast in for extra help, only to discover that Leech has miraculously been cured. Storm, realizing that she cannot lead the Morlocks, relinquishes her title to Callisto. Continuity Notes: Jubilee befriends a Morlock girl named Maryanna while she keeps watch over Leech. Also, Rogue claims that this is Jubilee’s first Christmas with the X-Men, which compresses the entire run of the series so far pretty tightly. “Huh?” Moment: Leech’s powers somehow knock the staff of the hospital he was sent to unconscious, which is odd since his power is the ability to take away a mutant’s powers. Production Note: The closing credits are back to featuring a clip from a previous episode, as opposed to the montage of past scenes with the standard theme playing in the background. Review: I guess every kids’ TV show has to have a Christmas episode, so here’s the X-Men’s contribution. What always struck me about this episode is that it’s one of the better-looking AKOM episodes; there aren’t any specific scenes that stand out, but the cast tends to be well-drawn and the overall look is pretty consistent. The fact that there’s only one brief action scene in the episode probably helps, giving the animators much less complicated movements to bring to life. It’s also one of the few episodes to feature every cast member (except for Beast) in normal clothing, and even though some of the X-Men have questionable taste in pajamas, most of the cast looks surprisingly okay. The Leech story obviously isn’t enough to fill twenty minutes, so the episode cuts to the X-Men’s Christmas Eve preparations throughout the show. Most of this material is on the level of an ‘80s sitcom, but some of the banter between Gambit and Jean (arguing in the kitchen over Christmas dinner) is cute. The real humor comes from Cyclops’ inability to sing a Christmas carol, which is the funniest moment of the episode, if not the entire series. Cyclops is so stiff, so utterly robotic, of course he can’t carry a note. And finally we’re supposed to be laughing at him. Regarding the main story, it hits all of the classic Christmas Special notes. The X-Men spend time with people less fortunate, grouchy Wolverine eventually gets into the Christmas spirit, and there’s a Christmas miracle just in time to save a sick kid. The story can’t be scrutinized too much without falling apart, though. If Wolverine’s blood could transfer his healing powers to someone else, the X-Men are horrible people for not storing a blood bank of it and offering it to the public. (And even Wolverine acknowledges that it shouldn’t work…but then gives a needlessly cryptic speech about the two times it actually did work, which is surely the oddest moment of the episode.) There’s also a continuity issue that causes problems, as the show once again transplants the comics’ continuity over its own. In the comics, yes, Storm did become leader of the Morlocks and then proceed to forget about their existence. 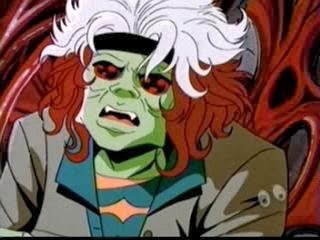 In the cartoon, however, Storm immediately named Callisto as the ruler in her place in episode five, most likely because the cartoon’s producers knew from the history of the comics that Storm stories and Morlock stories rarely intersect. Now, the show’s taking one of Storm’s angst points from the comics and transferring it into the cartoon, even though the show already made an effort to circumvent this potential problem years earlier. Also, what’s wrong with Leech in the first place? The episode’s unusually vague. I can’t imagine why no one ever says what’s wrong with him, unless the censors were squeamish about naming specific diseases that kill kids. Summary: Word leaks that there's a rat in the prison, which soon leads to a riot. Longshot lies and declares himself the rat in order to stop the violence. Wolverine faces Spiral and frees Phoenix. Bone is reunited with Miles. 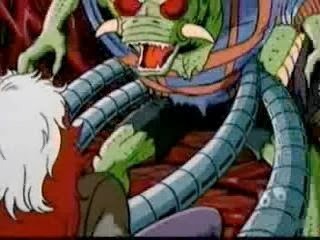 Longshot's allies unleash a computer virus that frees the prisoners, as Rita hacks into MAXROCK TV and exposes UltraMax’s abuses. The inmates unite against the guards, and Longshot, the despised rat. Phoenix frees Longshot from the execution chamber, while Major Domo is revealed as the warden and beaten down by the inmates. The Quinjet’s blasts send UltraMax out of orbit. Mojo escapes in his pod, not realizing that Phoenix has already placed the "Mojomaniacs" (killers created by his brain tampering) inside. As the team tries to keep UltraMax in orbit, Longshot reveals that Gambit gave Spiral false information earlier. Eventually, Beast manages to enter UltraMax’s controls and right the station. The liberated mutants are taken to the mansion's hospital wing. Public opinion, following Rita's broadcast, turns on UltraMax and it is shut down. Major Domo rebuilds himself and prepares to rescue Mojo. “Huh?” Moment: Miles is referred to as a boy repeatedly, even from Phoenix’s viewpoint, but the numbers don’t add up. His father spent fifteen years in prison, which didn’t happen until after Miles and his schoolmates were told to inform on their parents if they were involved with drugs. That would make Miles, at the very youngest, twenty. Review: There’s a lot packed into the final chapters of the novel, including a slightly gratuitous gladiator match between Longshot and Gambit, so the ending is somewhat chaotic. Nocenti obviously wants to tackle numerous issues, but there’s not nearly enough room to explore every wild thought she throws out there. The major conflicts of the novel are resolved (Bone confirms he never wanted revenge on Miles, Miles asks for his father’s forgiveness, Mojo is defeated, Gambit and Longshot make peace, UltraMax is shut down), but several of the plot threads barely feel connected to the central story. 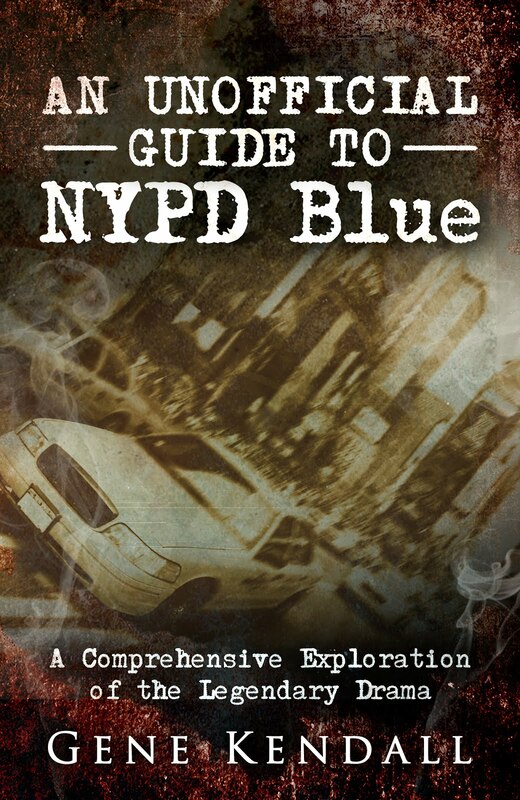 Is this is a story about the drug war, the prison system, teen suicide, human experimentation, War on Crime paranoia, junk culture, or the origins of insanity? Of course a story can cover more than one issue, but trying to touch on everything that might be on the author’s mind is dangerous. Mojo has three distinct plots going on during the novel -- he’s overtaken a prison and used it as the basis of a new television network, he’s released a series of bootleg videogames that will recruit highly intelligent players (apparently teens he wants to interact with, simply because he’s lonely...and he wants the rest to commit suicide, for some reason), and he’s using his mind-altering technology to breed a new race of remorseless killers. All of these ideas have potential, but why are they running simultaneously; aren’t we reading the plots to three different Mojo stories? What do mutants secretly placed in a space prison by the government have to do with bored teens that happen to be really good at video games? It’s easy to forgive the overloaded plot, though, because so many of Nocenti’s pithy digressions and character moments are genuinely intriguing. (She’s also the first person to pit Longshot and Gambit against each other in a fight, which is something I would’ve expected to see years earlier.) Chapter Twenty-One even opens with an unsettling detour to the suburbs to examine Susan Carlton, a nice enough lady who’s been sucked into watching the live execution. The entire passage is reminiscent of Orwell, a very brief example of just how good Nocenti can be. Playing off the prison theme, Nocenti explores the larger idea of imprisonment, that everyone is in a cage of his or her own making. Mojo has doomed himself to a life surrounded by sycophants, while Storm is caged by the demands of the responsibilities she’s accepted as leader of the X-Men. Miles is consumed by the guilt he feels for indirectly sending his father to prison. Phoenix is confined by the ethics taught to her by Xavier, which prevent her from “playing God” even as she touches the minds of the sick and deluded every day. And Rogue’s body is, of course, its own prison. Even the virtual reality game, which could easily be a quickie plot device of no real importance, opens the door for a thoughtful exploration of the X-Men’s personalities. The game tests the player to go past their normal boundaries in order to win, with the justification that nothing you do to your opponent is “real” so it’s okay to cut loose. Phoenix mind-fries her opponents while Wolverine embraces his bloodlust. When they regain consciousness, they have to readjust to reality and question the decisions they’ve made while in the transitional fog. The game’s hook is that it shames you for beating it. There’s also a recurring theme of lying as a virtue, the idea that a lie can be noble if it’s used to help someone overcome grief or self-doubt. The last example is in the epilogue, as Wolverine pretends that he didn’t carry Bone on his back during the final level of the game. “Wasn’t me. You musta made it on your own. You’re no coward, Bone.” Nocenti loves the concept of deception, including self-deception, but doesn’t seem to have the room to truly explore it here. I wish Nocenti would’ve focused more on these esoteric concepts, as opposed to the political activism that occasionally drags the novel down. Less politics, fewer plot threads, and the novel would've been a much tighter read. It remains a solid X-Men story, however, with some truly fantastic moments. Summary: Longshot escapes his cell and spies on Mojo. Phoenix telepathically convinces Mojo that he’s having a hallucinatory conversation with Longshot. Mojo declares that he will steal Longshot's martyrdom from him. Later, Phoenix is thrown into a neutralizing cell after she resists Mojo. Ricochet Rita tells Wolverine that Bone’s son was responsible for him going to prison. Rogue meets with Longshot and grants him his request of a last kiss. She absorbs his memories and learns of the planned revolt. Longshot slips Rogue a chip, a universal key for the mutant ward. She meets with Gambit and gives him the information. Spiral later shows Gambit a computer-generated film of Rogue and Longshot's “affair.” Furious, Gambit reveals Longshot’s plan to Spiral. Meanwhile, Storm and Beast realize that Phoenix and Gambit are also inside UltraMax. Continuity Notes: Beast has borrowed a Quinjet from the Avengers and modified it for space travel. 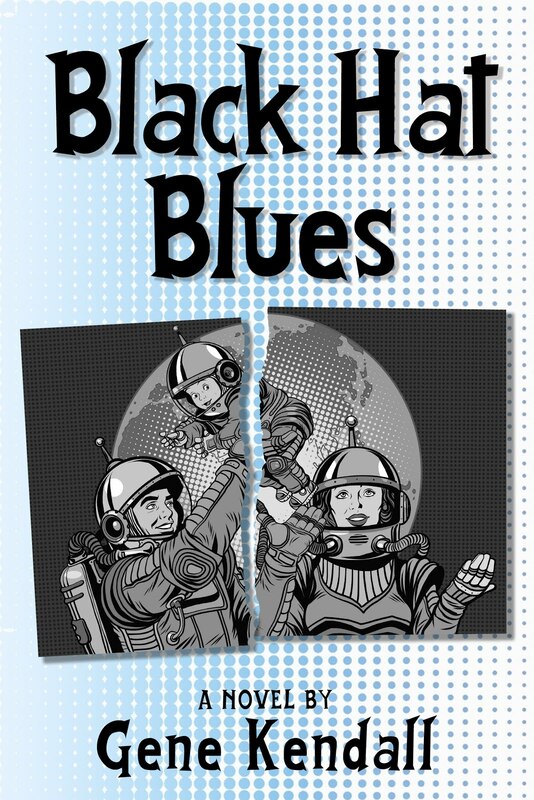 Why the Blackbird couldn’t be modified, as we’ve seen in previous issues of the comics, I don’t know. Beast suggests a bluff to Storm -- their modified Quinjet will knock UltraMax out of orbit unless their friends are released. Review: Everyone’s still getting into place for the finale, with a few decent twists thrown in. 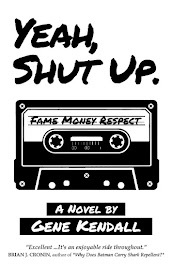 DJ Bone might not have such a pure motive for seeing his son again, as Rita claims he actually wants revenge on Miles for ratting him out for those “funny cigarettes.” Gambit is cast as a potential traitor once again, which uses the past continuity already discussed in the novel very well. Mojo also has an interesting change in motivation, as he now realizes that Longshot is more valuable to him alive than dead, and isn’t about to let him die and spark a true revolution. Mojo is often an insufferable character, but reading Nocenti’s interpretation gives a better idea of what she had in mind for the villain. His exchanges with Phoenix during this section are a lot of fun, as Mojo postulates that they’re both mind manipulators, he’s just working on a larger scale. By controlling the culture, he’ll rewrite history and remake the world in his image. A fairly standard supervillain motivation, but with an insane means of execution. Unfortunately, Nocenti isn’t done with the lectures just yet. Now it’s Ricochet Rita’s turn to give a multi-page screed against the American penal system. Nocenti is still rather vague about what exactly should be done to make prison “better,” without fundamentally changing what a prison has to be. According to Rita, it’s inhumane to even ask someone to have a cellmate, as it’s a terrible violation of privacy. Um, sure… Rita is also now an avowed Marxist revolutionary, which elicits the only real counter-argument from Wolverine in the novel, even as Nocenti makes it clear that Rita and Wolverine are innately attracted to one another. All things considered, I would rather not read references to Mumia Abu-Jamal in my X-Men stories, thanks. Summary: Wolverine reaches Level 10 in Miles’ VR game and is suddenly teleported with DJ Bone to UltraMax. Ricochet Rita recruits Wolverine to her side. Meanwhile, Beast receives an email Wolverine sent shortly before playing the game. He deduces that pure instinct is needed to beat the game, but Storm refuses Beast's request to finish Level 10. Later, Beast returns to the game, but forgets to turn on his failsafe. Phoenix discovers the Beast comatose. She joins the game and soon finds herself inside UltraMax. On Earth, Gambit decides he won’t let Rogue go to UltraMax alone. He allows himself to get caught robbing a store, then exposes his powers to the police. He’s sent to UltraMax, onboard the same shuttle that’s transporting Rogue. Later, Phoenix is taken to Mojo. Disoriented, she begins to invade his brain. “Huh?” Moment: Rogue’s false identity has her as a death row counselor and security guard. Is this a real thing? It sounds utterly bizarre to me. Review: This novel is worth buying if only for the opening of Chapter 14. Nocenti starts many of the chapters with a character study of one of the cast members, and her depiction of ten-year-old Jean Grey’s discovery of her mutant powers ranks amongst her finest writing. Back in the '80s, Chris Claremont crafted a dark origin story that had Jean’s powers emerge as she cradled her dying friend Annie and experienced her final thoughts. Nocenti continues the theme and creates an even more disturbing portrait of what telepathy could do to an adolescent. The day Annie dies, Jean discovers her dog loves meat more than he loves her. Soon, she’s learning the darkest secrets of her parents’ marriage. Her salvation comes in the form of Professor Xavier, who teaches her that “a trace of hate between a husband and wife” is common. The ethics, complications, and politics of telepathy are rich subjects that Nocenti could easily devote an entire novel to, one I’d love to read. The rest of this section mainly consists of characters finding ways to reach UltraMax. It’s pretty standard as these things go, assuming you’re willing to accept the concepts of a) an outer space prison, and b) video games that can teleport you there. Nocenti packs in an impressive amount of character work while she’s setting the pieces in place for the climax. Beast is envious of Wolverine for beating the game first. Gambit can’t bring himself to let Rogue go alone as the X-Men’s mole, so he develops an insane plan to join her. Rogue has to silently tolerate the other guards’ casual bigotry. Storm finds herself increasingly frustrated by the team’s unwillingness to listen to her. Phoenix speculates that Mojo is incredibly lonely after surrounding himself with sycophants for so long, so now he’s desperate to interact with the minds sharp enough to beat his games. Later, she mentally scans the convicts at UltraMax and finds herself torn between wanting to help them and kill them. (The quickie profiles of the inmates Nocenti creates are also haunting.) It’s easy to argue that the book has several disparate elements that don’t quite gel, but much of the novel’s appeal lies in the way the cast is written. They’re engaging characters, and you truly want to reach the end of the story with them.